I went to two Thanksgiving parties last weekend. The turkeys, the stuffing, all the side dishes, and oh! the pies! I made pumpkin pies and apple pies to take to the parties and they were a hit. 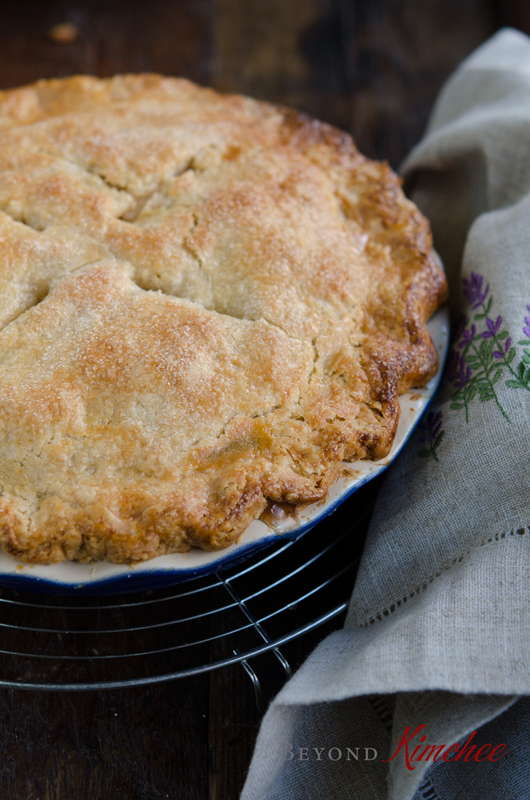 Apple pies are one of my favorite pies to make. There is nothing like the aroma of apple pie coming out of oven and the beauty of its golden look can steal many hearts of apple lovers. To me this classic American dessert along with the pumpkin pie is a must for our Thanksgiving feats. I like to use variety of baking apples to make my deep dish apple pies. 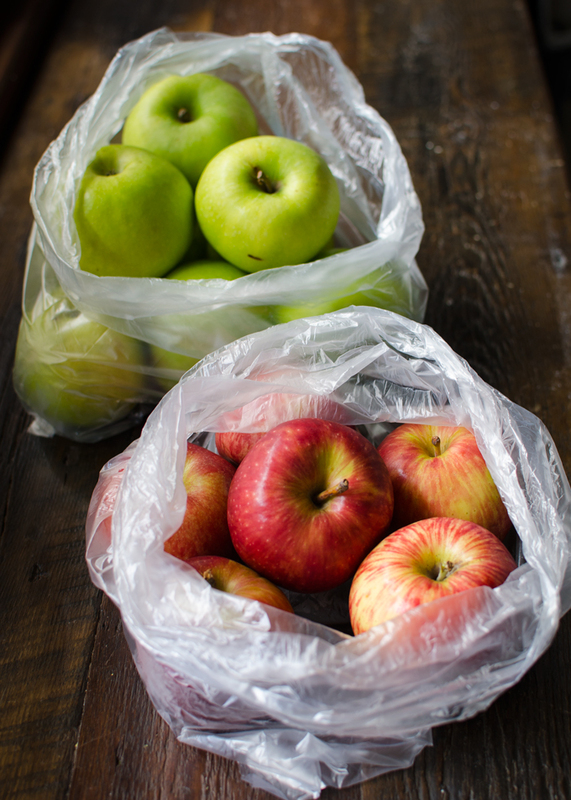 Granny Smith, Golden Delicious, Gala, Braeburn, Jonathan, McIntosh, Cortland, Honey Crisp apples are a great choice. 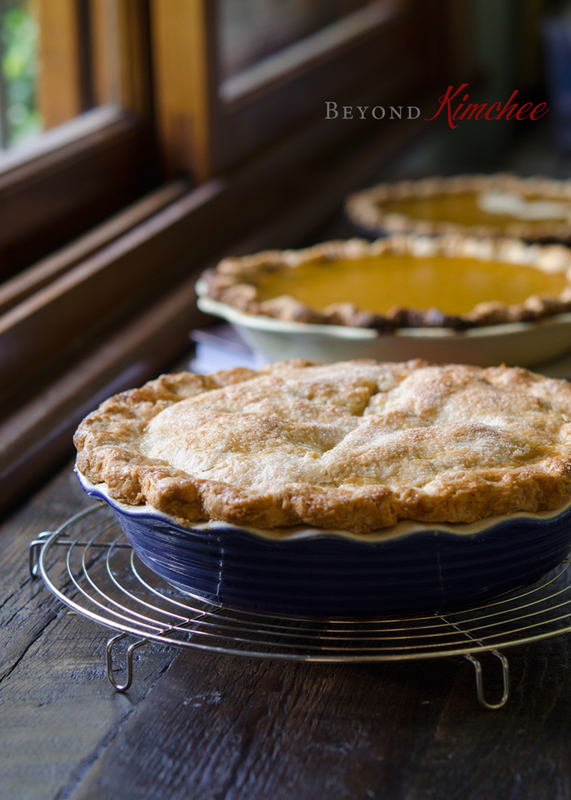 I would pick about 3 different types of baking apples to give extra flavor and texture of the pies. But living in Argentina, I can only find two kinds in the market these days; Granny Smith and Gala. It still came out wonderful and it tasted amazing. I wouldn’t try to make apple pies if you are in a hurry. Peeling and slicing apples can takes some time and I would like to enjoy my time with apples without the pressure of a time crunch. Well, any cooking can be frustrating if you have to hurry. So make sure you find a day for yourself to prepare for this old fashioned classic dessert! 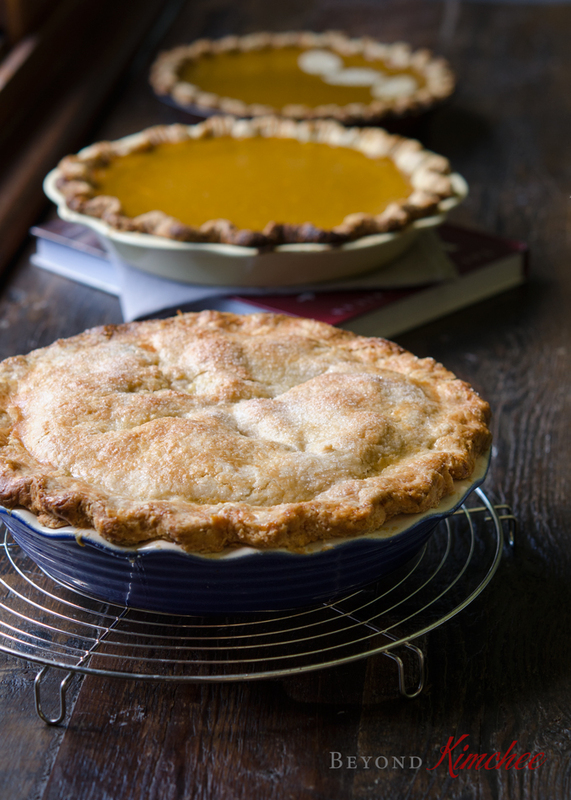 For the pie crust, there is nothing like a good homemade pie crust. Don’t you think? I use both butter and shortening. I also add egg and vinegar, too. Egg is 75% water and the addition of egg will cut down the amount of water in the dough. The vinegar will cut off the gluten to form, which helps to create a flaky crust. 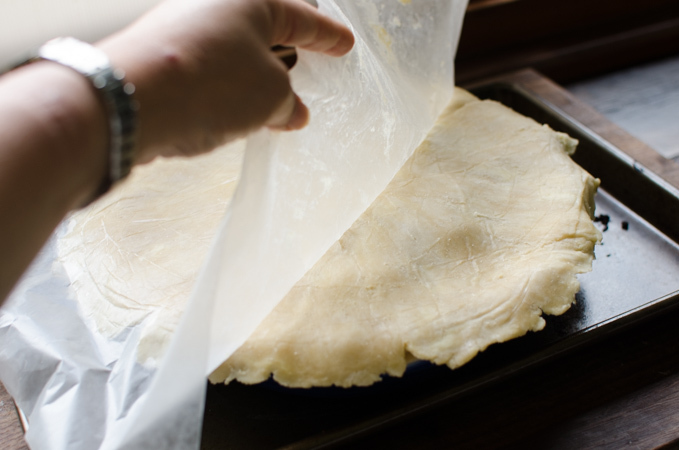 I would roll my pie dough in between the waxed papers so that I don’t have to add extra flour to the dough to prevent from sticking. This is a tip to make a light and flaky crust. Another tip I can share is that I coat the bottom of the crust with egg white to prevent the bottom of pie crust becoming soggy. I cover the pie pan with a rolled crust this way, and store it in the fridge while I am getting the filling ready. I mix my apple slices with only a little amount of cinnamon, because I don’t want the cinnamon to overpower the flavor of apples. I also use both white and brown sugars. It adds a little more flavor. 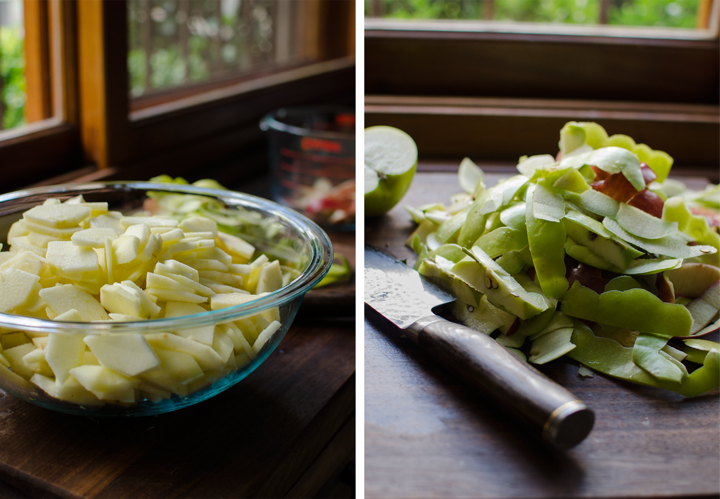 Cooking apples prior to bake will make softer filling and maintain the even look of your pie. 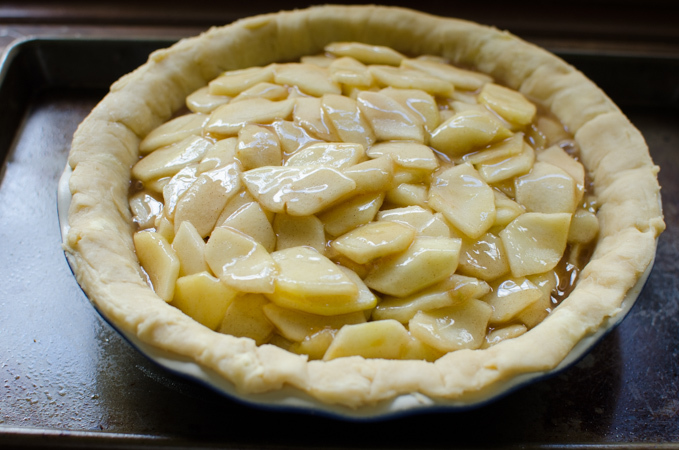 I have tried baking pies without cooking the apples in advance, and it created a big hollow space between the crust and the apple filling no matter how big I slit the top of the crust for the steam to escape. Put the cooled pie filling into the pie pan. I used 12 cups of sliced apples and they cooked down a lot. Cover with another pie crust on top. Flute the edge with whatever pattern you like. Brush with egg wash, cut 4 long slit for the steam to escape, and sprinkle with granulated sugar on top. 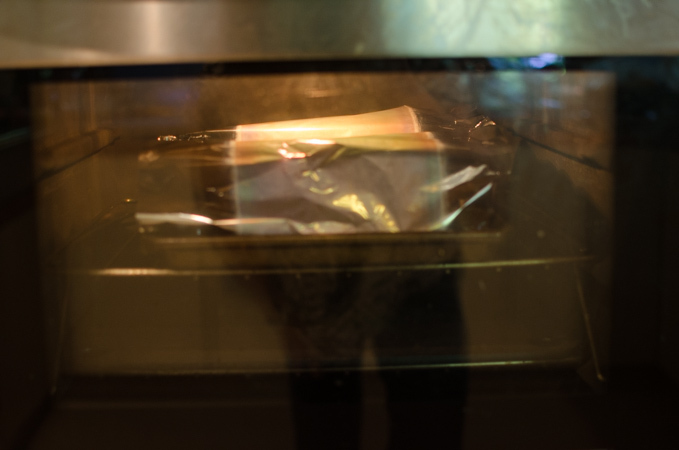 Bake in the preheated 400˚F oven for 30 minutes. It will have perfectly and evenly browned crust on top, but 30 minute is not enough for the apples to cook down. You need to bake longer. In order to prevent for the crust to burn during the long period of baking, make a tent with foil to cover the top of the crust loosely. Bake 30-40 more minutes. I wish I can show you a slice but I had to take this pie to the party. I have to tell you that I’ve got a rave reviews from the people. The crust was soft and flaky, and the mildly spiced apples were tender with just right amount of sweetness. With a dollop of cream or vanilla ice cream, it will melt your heart. Pie making is a labor of love. It did require a good half day for me to complete from start to finish including chilling and baking time, but it is so worth the time and effort for a special day like Thanksgiving to share with my loved ones. I hope you have a wonderful Thanksgiving and enjoy all the scrumptious food! Eat and be merry! combine flour, salt and sugar in a mixing bowl, add butter pieces and shortening. Using a dough or pastry blender, cut in the fat until the mixture looks like coarse crumbs with a few bits the size of small peas remaining. Beat egg, vinegar and 4 tablespoon water in a small bowl and add to the flour mixture. Using a fork, toss the mixture together to form clumps. If the dough seems too dry add a little more water. 15- 20 strokes should be enough ad make sure you reach down to the bottom of the bowl to moisten. 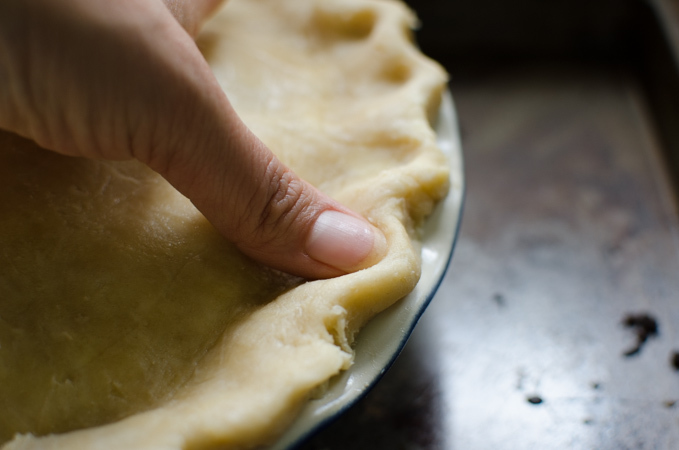 Check the consistency by pinching a small amount of dough between your fingertips. If it is holds together smoothly and be moist, it should be ready. Turn the dough onto lightly floured board. Gather up the dough and flatten down to make 5-6 inch disk. Cut the dough in half and form each half into a disk again. Wrap with in plastic and refrigerate for at least 45 minutes . The dough can be refrigerate for 2 days or 1 month in the freezer. 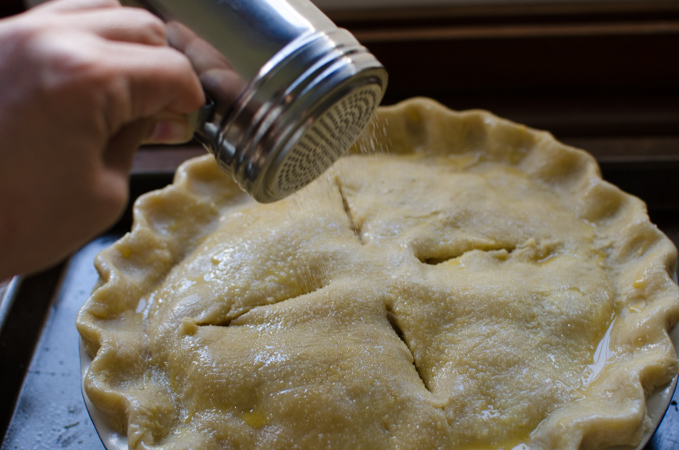 When ready to make pie, take the dough out of refrigerator and hammer with rolling pin 2-3 times to loosen up the harden fat. 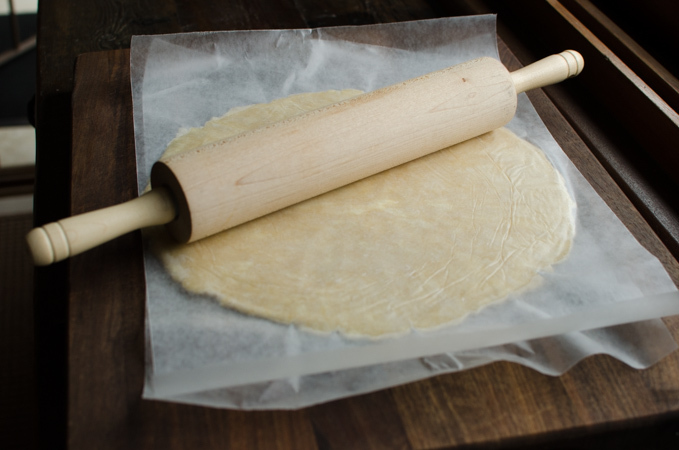 Place the dough in between 2 pieces of waxed paper and roll into a 13-14 inch round. If the dough seems too soft to peel off the paper, chill in the fridge for 15 minutes. Remove the one side of waxed paper and place onto the deep dish pie pan. Peel off the the remaining paper. Smooth the dough into the pan and trim the overhang. 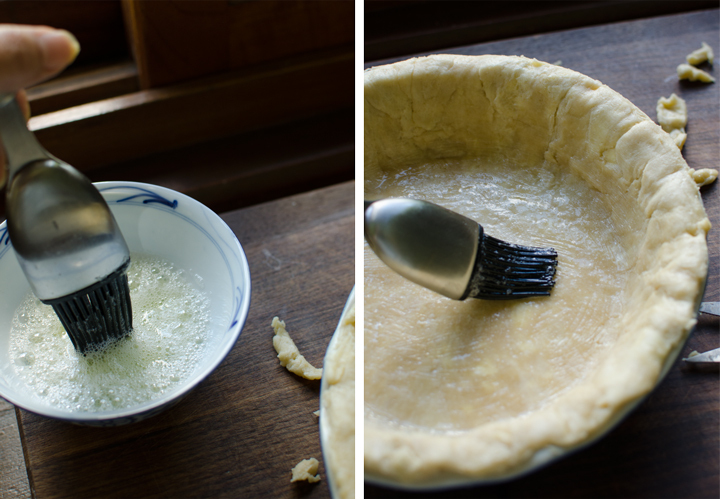 Brush the bottom of the pie pan with the beaten egg white and keep in the fridge while the filling is getting ready. Roll out the second crust in the same manner and chill in the fridge with the waxed paper attached each side. Position the rack in the lower third of the oven and preheat the oven to 400˚F. 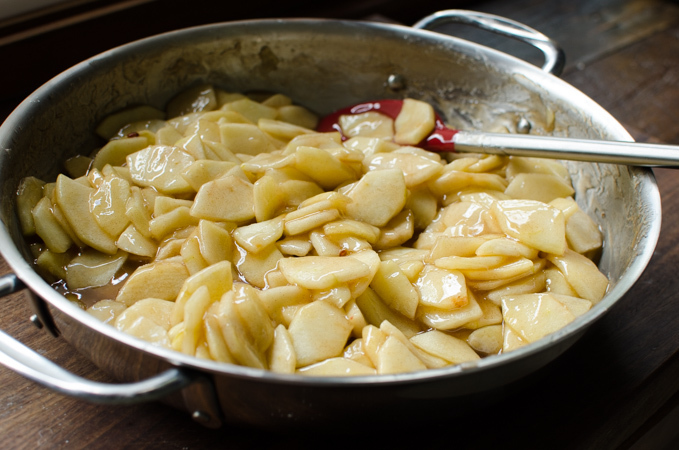 Put apples in a large pot or skillet and toss with the lemon juice. Add the flour, sugars, salt, cinnamon, and cornstarch.If your apples seem to be very juicy, use larger amount of the cornstarch. Mix well and bring to medium-high heat to boil. Boil for 3 minutes stirring and scraping the bottom of the pot. The apples should be cooked down. 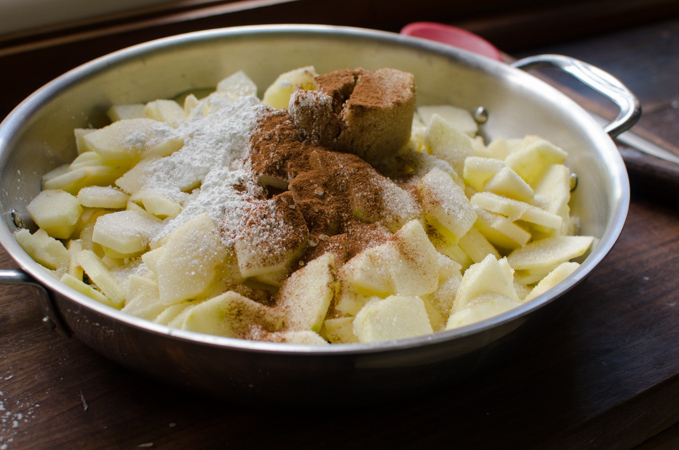 Turn out the apple mixture into the pie pan. Peel off one side of waxed paper from the second crust and place over the apples in the pan. Trim the overhang to 1/2 inch. Fold the overhang under the bottom of the pastry and press the layers together firmly. Flute with your fingers as your desire. Brush the top with egg wash and cut generous slashes for the steam to escape. Sprinkle with sugar. Set the pie pan on a baking sheet and bake for 30 minutes. Make a foil tent over the pie top so the entire crust is covered. Continue to bake 30-40 minutes, or until the top is nicely browned and the filling is bubbly. Transfer the pie to a wired rack. Let it cool before serving. Serve a pie with a dollop of whipped cream or vanilla ice cream. Enjoy! thank you for this recipe. I never seem to go wrong with your recipes, they are always a hit. But I was deciding which apple pie recipe to use, you posted in the nick of time. I will be using your recipe. I have made your pumpkin bundt cake about 4 times since your posting; absolutely divine. you said it right when you said that you think the spices are a perfect blend; they are a perfect blend for me too. Thank you thank you. So glad that you liked my pumpkin bundt cake. Hope your pie will turn out great. Let me know how it goes. Love to hear from you again. I substituted "maple extract" for maple syrup. I didn't want to purchase a whole bottle of syrup that my family may not eat and I wanted my frosting to be that golden brown color, and that rich maple flavor. It turned out great, but with the cream cheese, I could never get my frosting to drizzle like yours, either too thick like frosting, or too runny, I had a hard time getting it to set up when it was so thin. Maybe you poured yours on a hot out of the oven cake? Suggestions? Hi d I use about 4 tablespoons of maple syrup in the glaze and that helps to thin out the cream cheese. I am not sure you can use that much of amount with the maple extract to thin out the glaze. If the glaze seems too thick, I would add milk a little bit at a time to reach to the right consistency. Also make sure your cream cheese is in room temperature to be soft. Cool your bundt cake completely before you drizzle the glaze. I hope you can give it another shot. It is a really lovely cake with the full of autumn flavor. Apple pie is one of my favorites! And you've made a good one -- terrific recipe, really nice pictures. Thanks so much. Oh my goodness, this pie is gorgeous!! I seriously need to make pie more often. Holly, you`re making my drool! Apple pie is seriously my favorite kind of pie. I wish I had a deep dish pie pan to make this! Your crust sounds fantastic! I definitely want to try making it one day. Hi Holly Am making this fantastic pie again for Perfect Pi Day today. Yum!!! Hi Tarmar It is wonderful to hear that you like this apple pie. It is my husband's favorite and everyone who tasted it raved. Have a fun on making. Happy perfect pie day! Thank you, Tamar. Happy Thanksgiving to you, too!